Openness as one issue with a bearing on the long-term viability of investments in a system has already been mentioned. In addition, a number of technical and strategic considerations also play crucial roles in making a safe investment decision for the long term. Summation frame protocols are more susceptible to interference than single frame protocols. If a frame is destroyed, summation frame protocols always lose an entire cycle. Since it uses two telegrams, in this comparison SERCOS III actually provides 50 % better performance than EtherCAT. One special EtherCAT feature is the option to route all communication through the internal I/O terminal bus as well. However, the superior per- formance often cited in connection with this feature is offset by the safety risk due to increased susceptibility for interference (contacts and EMC). EtherCAT and SERCOS III networks always constitute a logical ring. That ring can be physically closed at the master, or, in the case of a daisy chain, closed internally at the last node in the physical line. EtherCAT does provide for trunks to branch out via special junctions, but the entire frame travels up and back down such lateral network lines, i.e. the network as a whole still represents a logical ring. Only in the case of POWERLINK have master and cable redundancy been included in the specifications, and have been implemented in actual projects. 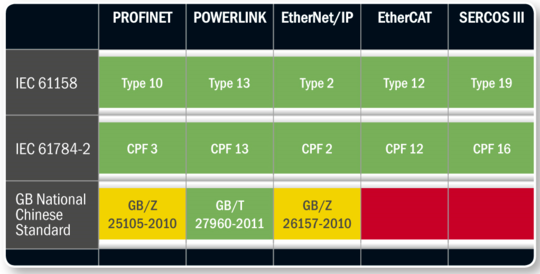 For PROFINET and EtherNet/IP, application implementations based on special switches are feasible. POWERLINK, EtherNet/IP, and PROFINET give users hot plugging capability. Some restrictions apply for SERCOS III and EtherCAT due to the compulsory ring topology. In a physical ring topology, SERCOS III does allow for taking a single node off a network. In this event, the two neighboring nodes close the TX and RX lines. Nodes can then be reached from either side of the master. EtherCAT provides some hot plugging capability: In the EtherCAT Slave Controller, open ports are automatically closed if no link is detected. EtherCAT’s distributed clocks, however, requires re-synchronization, which may affect certain applications. 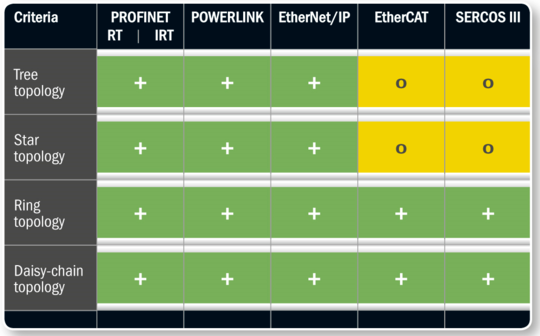 For technologies based on a logical ring (EtherCAT and SERCOS III), the limitations of the network topology also limit hot plugging capability. Hot pluggable modules can only be connected to one end of a daisy chain (SERCOS III) and distributed clocks require re-synchronization after node failure, which may impose restrictions on applications. As EtherNet/IP and POWERLINK are entirely software-based techno- logies, these protocols can also be used with Gigabit hardware. EtherCAT can be scaled to Gigabit but requires an ASIC redesign. PROFINET IRT also requires some redesign of the hardware, which con- cerns switches in particular. FPGA solutions can be ported to Gigabit. sercos International has stated that their IP core is basically Gigabit-ready. The IEC 61158 international standard standardizes protocols (called “Types”) for use in industrial control systems. IEC 61784-2 standardizes communication profile families (called “CPF”). GB standards are National Chinese Standards written and issued by the Standardization Authority in China (SAC). They are valid across all industries and nationwide. GB/Z stands for national technical guidelines. These are primarily informative in nature and in no way binding. The highest authorized standardization level for communication technologies is GB/T. As a Chinese recommended industrial standard, GB/T must meet several requirements: It must be fully open technology, widely used and standard technology in the world. It must not be subject to any country or company. IRT products based on ERTEC technology are generally available on the market. However, the introduction of the DFP feature and the new generation of ASICs in conjunction with it (e.g. the Tiger Chip supplied by Phoenix) has raised doubts concerning the future compatibility of current IRT solutions.